The American market for high-end design is "growing incredibly" according to European brands, who are opening showrooms and restructuring their US businesses to take advantage of booming sales. 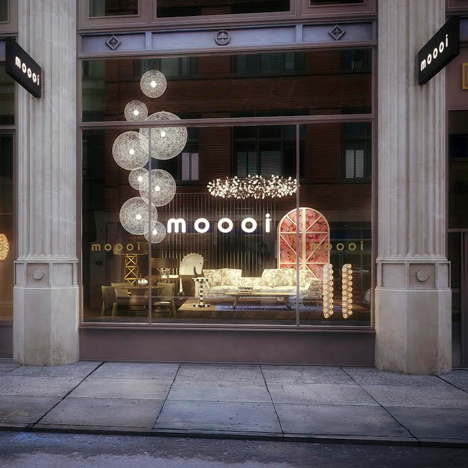 "Our major export goes to the United States," said Casper Vissers, co-founder of Dutch furniture and lighting brand Moooi, which is opening a flagship store in Manhattan next week during the city's NYCxDesign festivities. The showroom on East 31st Street (pictured above) is the brand's first outside Europe. "Twenty eight per cent of our turnover is in America," Vissers said. "It's the reason we're opening our store in New York." Whereas a few years ago design brands were buzzing with excitement about the potential to do business in China, the US has now become a far bigger and easier proposition, given its strong economy and the lack of cultural and linguistic barriers. "I think China will take a little bit more time," said Piero Gandini, CEO of Italian lighting brand Flos. "It’s much easier of course for companies like us to perform [in the USA]. The architects are used to using our products and the market is already there." "We see business, especially the residential business, growing incredibly in New York and Miami," said Andrea Molteni, head of product development at Italian kitchen brand Dada, who said the luxury condominium towers being constructed in both cities are setting new international standards in terms of design and quality. "Every time we receive a bid to work on a project it's always setting the bar a little bit higher in terms of being more exclusive, more detailed, or [having] a small extra feature that the architects are trying to put in," he said. With so many projects coming on stream at the same time, Molteni said that developers "need to sell their apartments and they need to have stories to tell, and one of the stories now is quality and design." Dada is supplying kitchens to prestige Miami developments designed by Foster + Partners and Piero Lissoni, and is working with Herzog & de Meuron on the 56 Leonard Street tower in New York. Another brand seeing strong growth in America is Italian luxury kitchen brand Boffi. "The best market is the US market," said the brand's CEO Roberto Gavizzi. "It's a very strong market." Boffi recently bought Italian furniture brand De Padova, partly in order to help it grow in the US. Gavizzi said that being able to offer furniture alongside its existing kitchens, bathrooms and fitted wardrobes would boost its ability to win business in America. Boffi is particularly targeting Miami, which is fast turning into a major cultural destination with signature architecture to match. "Miami has become an incredible hub of the Latin-American world and also for North American people," Gavizzi said. "It's the place where they like to invest in real estate, where they like to go on holidays, where they like to have second homes. And all Americans, if they think about having something nice in the northern hemisphere, want to invest in Miami." European trade shows are getting in on the act too, with Paris-based homewares fair Maison&Objet launching a satellite show in Miami this month. Running from 12-15 May, Maison&Objet Americas is described as "a major event that will give birth to the first professional platform dedicated to the North and South American markets". Featuring an abundance of European exhibitors, the show overlaps NYCxDesign in New York, which runs from 8-19 May. NYCxDesign is anchored by the International Contemporary Furniture Fair – one of the USA's key design events and the key annual American show for many European design firms. The timing of Maison&Objet Americas allows overseas visitors to visit both shows in a single transatlantic hop. Flos is similarly seeing strong sales in America, which is now its fastest-growing market. The lighting brand's CEO Piero Gandini said that the strong economy is encouraging sophisticated consumers in the big American cities to spend money on design. "They are into the taste of design already, at least in the big cities," he said. "Miami, Chicago, New York, Los Angeles, San Francisco. We're talking about the biggest economy in the world and when they open the gas they really go fast." Flos has divided its US operation into two parts – one dedicated to the contract market and another to the consumer market – to better serve both. Flos is investing in its architectural lighting business and hiring specialist staff in order to win more work on luxury residential projects. Flos is also looking to acquire American companies to help it grow. "We are thinking eventually to buy some small local companies who are good at custom lighting to have the kind of flexibility locally that we have in Europe," Gandini said. Moooi creative director Marcel Wanders said that business growth in America was part of a wider trend of increasing design awareness in the country. "I think in the United States design is picking up," he said. "More and more people are getting the idea that it's for them. It hasn't happened overnight; it's something that is growing. You see US companies starting to be more successful based on design and seeing that design is something interesting not only for culture but also for business."